This is an experiment we made some months ago. The EPROM was crack-opened by the owner. 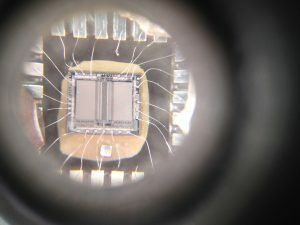 A microscope image show us that connections in +Vcc and Ground were interrupted. So EPROM wasn’t recognized by our instruments. Our idea was to try reconnecting the pin to the pad into the silicon circuit, applying two tiny wires. Result wasn’t good on this EPROM: we can read it but the content is blanked out, maybe for the current spike as a result of the wrong insertion. We think is completely damaged.